Not every group lasts. But, 80% should. There is no worse feeling than coming off of a stellar six week series only to see a lot of group leaders quit. After all of the work you went to putting groups together, now you just watch them fall apart. This doesn’t have to happen. 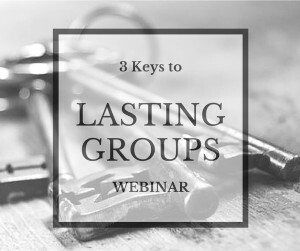 In the last 10 years coaching over 1,500 churches, I have discovered three keys to starting groups that actually last beyond a six week series. In fact, I would be so bold as to say, if at least 80% of your groups don’t continue, something is seriously wrong with your strategy. Now, I am not a know-it-all when it comes to groups. In fact, I wouldn’t even call myself an “expert,” because the title expert means you already know everything and have stopped learning. That’s not me at all. I am more of a small group pioneer (read: “test monkey”). I’ve tried a bunch of stuff. A lot of it didn’t work, but some of it did. Let me share these three keys with you.